Thai massage is a type of massage in Thai style that involves stretching and deep massage. This form of bodywork is usually performed on the floor, and the client wears comfortable clothes that allow for movement. 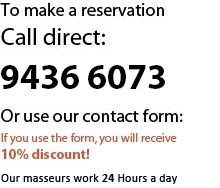 No oils are used in Thai massage. It is known in Thailand as “nuat phaen boran”, literally translated to “the ancient-manner massage.” In Thailand, Thai massage is one of the branches of Traditional Thai Medicine (TTM), now recognized and regulated by the government, and is widely considered to be a medical discipline used for the treatment of a wide variety of ailments. The founder of Thai massage and medicine is said to have been Shivago Komarpaj, who is said in the Pali Buddhist Canon to have been the Buddha’s physician over 2500 years ago. In fact, the history Thai massage is more complex than this legend of a single founded would suggest. Thai massage, like Traditional Thai Medicine more generally, is a combination of influences from Indian, Chinese, Southeast Asian cultural spheres and traditions of medicine. The art as it is practiced today is likely to be the product of a 19th century synthesis of various healing traditions from all over the kingdom. Generally speaking, practitioners of modern Thai massage operate on the theory that the body is permeated with “lom,” or “air,” which is inhaled into the lungs and which subsequently travels throughout the body along 72,000 pathways called “sen,” or “vessels.” Typically, massage therapists manipulate a handful of major sen lines by pressing certain points along the lines. In most models, the sen originate at the navel and spread throughout the body to terminate at the orifices. A significant part of the practice of Thai massage also includes yoga-like stretches which are intended to stimulate the sen and move lom through the body via a pumping action which is connected with the patient’s breathing. The theory of sen and lom is often translated into English as “meridians” and “energy.” While there are some superficial similarities to Chinese meridian theory, the Thai system is markedly different as the sen are unconnected from the internal organs.